What a great day I had on Thursday with my youngest sister. We went for lunch, did some shopping, then fancied going to the seaside to have a bag of chips by the sea. We looked at the map and decide to have a change from Hunstanton and Great Yarmouth, so went to Clacton-On-Sea. We had such a laugh, took some piccies, had our chips and finally got back to hers at around midnight! I arrived home today to some parcels. 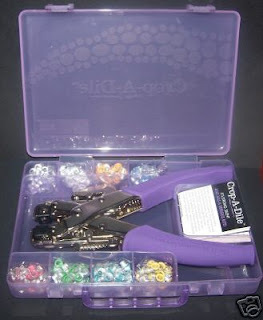 A glittergirls embossing tool I 'won' on E-Bay, my Ellison order and a purple crop-a-dile and eyelets in a purple case. I'm stopping out more often if that's what happens when I get home. Also, last night I 'won' a standalone printer, so I can print my photos, Dottie and sayings out as I want. It also scans and is a B & W photocopier. I got it for more than half the price I've seen it in a shop and on-line. My crafting's taken a back seat this week, but I will hopefully have things to show you by Monday. I did manage to cover some chipboard and make a start on a mini journal book for me. Now I've got my crop-a-dile, I'll be able to punch the holes and finish the covers and intro page. I intend completing a page per week for a year or so. Should've started it in January really, but better late than never. Glad you had a lovely day with your Sister! Nothing like a proper bag of chips from the seaside imho lol! Sounds like a fabby day with your sister and then finding all your goodies, well done on your winnings :) have fun playing.